Deep breath in. Deep breath out. I can sense the world settling down around me. It’s a good feeling. In my head I had aimed for June 14th as an end to the chaos, but then amended it to June 16th after realizing that we still had a play rehearsal, a play casting call, my mother’s arrival, Father’s Day shopping, and my daughter’s play to wrap up over the weekend. Still pretty busy. Of all the things I’m proud of this year, near the very top is my sixth... no seventh grader’s play. You see, she was selected, along with two other students and three older women, to write a ten-minute play featuring characters from the younger and the older generations. Then over the course of the last few months, the play took shape with actors and staging and props and lighting. The whole thing! The actors could use their scripts, because technically it was a play reading, but the teen and the kid in her play were off-book for the final production. It was wonderful. The actors were great, and in all honesty, I think it was the best of the six plays. While I asked her questions to help her shape the story, and Bill helped her understand the logistics of writing a play, my kid wrote the whole thing and it was fabulous. And now with it done... breathe in, breathe out. Smooth sailing for the summer. I’ll be working on the getting the prizes out to the 48 Hour Book Challenge winners. I need to catch up on some email and blog reading. Laundry is beginning to be an issue. But how nice to take care of everything with air in my lungs. Deep breath... and out. Ahhh. So now my news. Not News. But news, little n. Over the summer I’m having a book club with my rising seventh grade Girl Scout troop, and you’re invited to read along. Every two weeks we’ll be reading a book, generally a coming-of-age/transitions type book, and getting together to talk about it. I’m hoping to have the authors answer interview questions from the girls and post them on my blog the following week. I haven’t exactly asked said authors, so let’s all hope for the best. In fact, before announcing the whole schedule, maybe I’ll check in with those writers. But I will announce the first book anyway, because I’m unstoppable. I’ll be meeting with my girls on Tuesday, July 1st. I’ll write up our discussion for Wednesday, July 2nd, inviting your participation. 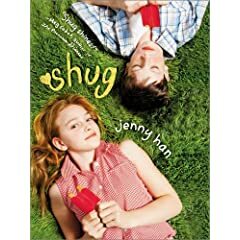 The first book in the MotherReader Summer Book Club is... Shug, by Jenny Han. This was a book I absolutely loved two years ago, and I can’t wait to share it with my daughter, her friends, and... you. SHUG is a great choice for a mother-daughter book club! You'll have such fun. I was able to participate in one of those last year and I was impressed by how perceptive those girls were. And my girls both loved Shug. I loved Shug! Great book for your mother-daughter book club! Perhaps your daughter can adapt this to a play? I am SO thrilled to be chosen for your book club!! I love love love Girl Scouts and always wished I could be one so I could sell the cookies. I would be more than happy to answer any questions your girls have! When do cookies go on sale again anyway?? p.s. thanks for lookin out, little willow!! When I read the words "coming-of-age/transitions type book" I thought: "oh, they must read Shug". And you are. I think it's perfect for this book club. Enjoy!